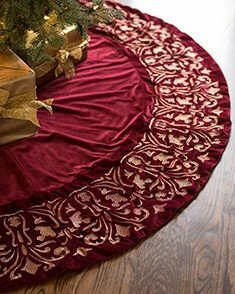 Our Luxe Embroidered Velvet Tree Skirt brings the elegance of the Victorian era to your tree, with its rich red color, gold damask embroidery, and elaborate design. This Balsam Hill exclusive measures 72 inches in diameter and is made from 100% polyester with 100% cotton backing, and features a plush ribbon closure for decorating ease. If you have any questions about this product by Balsam Hill, contact us by completing and submitting the form below. If you are looking for a specif part number, please include it with your message.